I first saw this recipe a couple of years ago when I purchased the Gather cookbook. My friend Carrie and I agreed that I should make these. What appealed to me was the idea of enjoying a scone that had a fair amount of nutritional value. Since then, I have made them numerous times, each time enjoying them and remarking to myself how quick and easy they are. In a medium-sized mixing bowl, combine almond flour, a quarter cup of arrowroot flour, salt, and baking powder. In a smaller mixing bowl, combine maple syrup, melted coconut oil, and one egg. Blend with a hand mixer until smooth. * Note: You do not need to use the Hain brand of baking powder. The recipe works with other grades of maple syrup; B just has a fuller flavor. Pour wet ingredients into dry, and fold in with a rubber spatula until all ingredients are evenly combined. 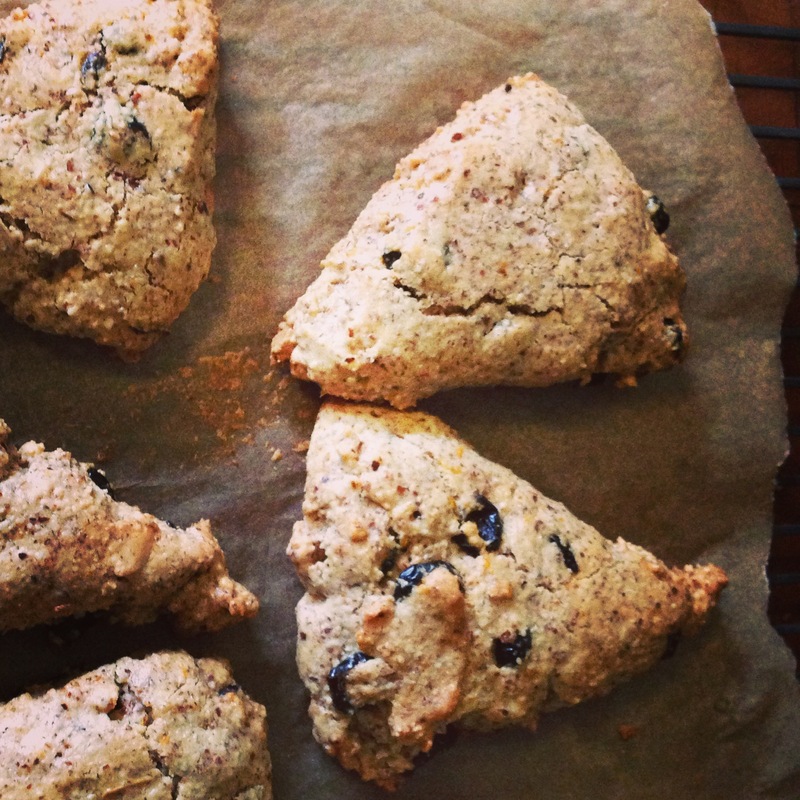 To make orange scones, add the orange zest; to make cranberry scones, add dried cranberries instead. Add 2 tablespoons of arrowroot flour to the batter to thicken the dough. Line a baking sheet with parchment paper. Form dough into a ball. Place the ball of dough on the parchment lined baking sheet and flatten slightly. Carefully cut the dough into eight equal wedges, and spread them out on the parchment lined baking sheet so they are about 2 inches apart. Bake at 350 degrees F for 20 minutes. NOTE: These are also good with dried cherries and sliced almonds or dried blueberries with lemon zest. This entry was posted in Breakfast, Gluten-free, Recipes and tagged Baking. Bookmark the permalink. You are NAILING the photos ! !